Our Suburban Farm: Please help this wonderful cause! As I wrote about here, my sister is a Peace Corps volunteer in Morocco. When she arrived there, she did a needs assessment and found the dire need for a women's center. The women there have little to no access to education or healthcare. Additionally, they have no opportunity to make money for their families. My sister decided to pursue the building of a women's center. She hounded the local government and local organizations until they committed almost 50% of the funds. She was left to round up around $16,000. We have had wonderful family and friends contribute to the project and the total is down to around $7,000. The VERY exciting part is that she just got word today that USAID approved a grant for $3,500! The total is down to $4,300. That is all she has left to COMPLETELY fund this project. The catch....she has 10 days left to do it. Whatever funds she receives after the 10 days will be used to build her project, however, if she does not receive the complete amount, a vital part of her master plan may be missing (such as the literacy center or health room). Even if the entire amount isn't reached, EVERY SINGLE little bit helps. I am reaching out to you! Please take a moment to consider donating to this worthwhile cause. You can read more about the project on my link above in my first post about this. In addition, you can read her most recent post below or on her blog. Thank you for taking the time to support my sister and the work she is doing for women worldwide. This morning, I received word from Peace Corps that USAID has approved my grant request for $3,500. This means we are $3,500 closer to being ready to build the Women's Center. This also means we have $4,300 left to raise. And 10 days to do it!!! After 10 days, the project will be taken off the Peace Corps website, and will be considered closed for funding. We have decided to take whatever funds we have when these 10 days are up. This is to ensure project completion before I finish my service here in May. HOWEVER, if we don't raise the $4,300 over the next week and a half, we will have to reduce some of the services we are planning on offering to the girls when the Women's Center is built. 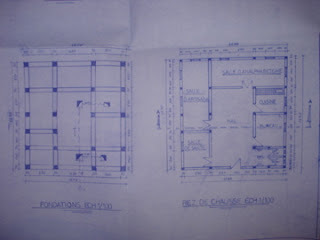 For example, $4,300 could be the amount that funds the construction of the literacy room. Or the health room. If we don't raise these funds, one of the services of the Women's Center will have to go. Please, share this need with friends and family and co workers and anyone who might want to donate in the next 10 days. Also, a wonderful family from CHS is hosting a Henna Party next Saturday (the 14th) to help raise some last minute funds. Contact my mom or sister for details! Here it is, one more time, the link to Donate to the Women's Center. The website will not reflect the $3,500 grant that was just approved. This is because it is a grant through USAID and not Peace Corps. Remember, $4,300 is the magic number to have a complete Women's Center! 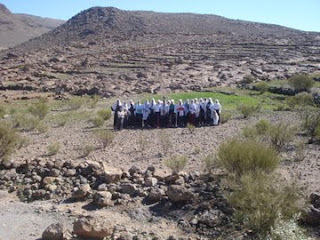 Here are the girls standing on the land that will soon be the Talbrjte Women's Center!